Stefaan Verhulst and Andrew Young in The Conversation Global: “The modern era is marked by growing faith in the power of data. “Big data”, “open data”, and “evidence-based decision-making” have become buzzwords, touted as solutions to the world’s most complex and persistent problems, from corruption and famine to the refugee crisis. The GovLab at New York University spent the last year trying to answer that question…. 1. We need a framework – Overall, there is still little evidence to substantiate the enthusiastic claims that open data can foment sustainable development and transform governance. That’s not surprising given the early stage of most open data initiatives. 2. 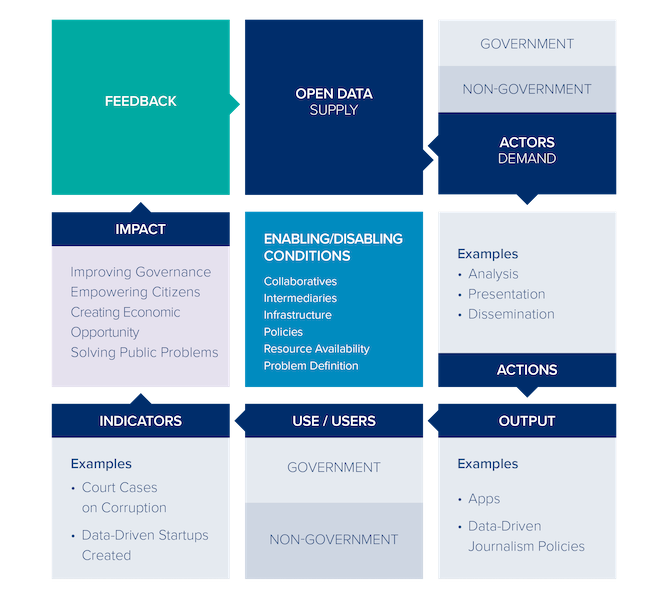 Open data has real promise – Based on this framework and the underlying evidence that fed into it, we can guardedly conclude that open data does in fact spur development – but only under certain conditions and within the right supporting ecosystem. And in Colombia, the International Centre for Tropical Agriculture launched Aclímate Colombia, a tool that gives smallholder farmers data-driven insight into planting strategies that makes them more resilient to climate change…. 3. Open data can improve people’s lives Examining projects in a number of sectors critical to development, including health, humanitarian aid, agriculture, poverty alleviation, energy and education, we found four main ways that data can have an impact…. 5. The ingredients matter To better understand why some open data projects fail while others succeed, we created a “periodic table” of open data (below), which includes 27 enabling factors divided into five broad categories….